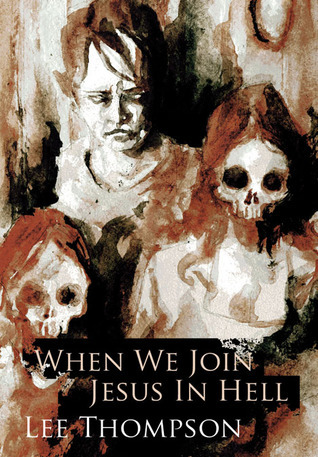 When We Join Jesus in Hell is a new novella from Lee Thompson. Home, he thinks, Where the heart bleeds freely. A hell of a boxer, he earned the nickname 'Fist' back in the day. But during the past eight years, he's transformed into somebody he no longer knows—a weak, pitiful, and passionless office drone. Barely hanging onto the last thread of his self-respect, he returns home one night to discover Hell has truly crossed its threshold. And Hell has lessons to teach him through what fragments remain. Forgiveness, clarity and redemption in commitment. Most of you know by now I'm a big fan of Lee Thompson. I have quite a few reviews around here from his epic Division series. When We Join Jesus in Hell is a notable departure from his Division mythos, but it is a testament to Thompson's awesome, dark imagination. When We Join Jesus in Hell is a great read, but it is also a tough read. It is brutal and heartbreaking. It won't be for everyone, but for those of you who appreciate dark, unapologetic, and emotional stories, it will leave its mark and make you a fan as well. If you've been wanting to check out Thompson's work, When We Join Jesus in Hell is a great stand alone place to start. I've got Down Here in the Dark on my TBR pile--one of these days--but I think I'll have to find one of Lee's earlier books to read next. Only read Before Leonora Wakes so far in the long fiction dept. If you want to read another long fiction, I'd read Nursery Rhymes 4 Dead Children next. For an earlier novella, I'd say Iron Butterflies Rust. Jen: Thanks again for all the support and for the new review! Hugs to you and the family! Gef: Thanks so much for giving my work a try and for hosting that giveaway on your blog! Thank you for holding on to your imagination, Lee. That cover is quite creepy. I'm a big fan of Lee Thompson and this book is a great read. It is brutal and heartbreaking. Well written.